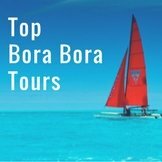 Glowing Intercontinental Bora Bora Thalasso reviews from real travelers result in this fabulous Bora Bora hotel continuously winning prestigious awards. 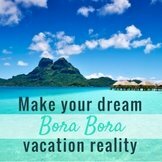 You can trust the opinions of Bora Bora vacationers who have paid for their accommodation. Conde Naste readers gave the Thalasso the honor of 'Best Overseas Leisure Hotel' in Australasia and the South Pacific in 2011. 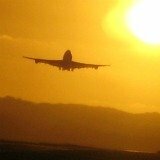 The many thousands of Conde Naste readers are discriminating, experienced vacationers. 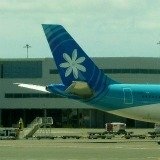 A June 2011 Travel and Leisure reader's poll for 'Worlds Best Service' honored the Intercontinental Bora Bora with 2nd position in Australia, New Zealand and the South Pacific. It scored 93.33 out of 100 for guest satisfaction in 5 categories: rooms/facilities, location, service, restaurants/food, value. The 2011 Travel and Leisure magazine's 'World's Best Awards' placed the Intercontinental Thalasso number 37 in the 'Top 100 Hotels in the World'. 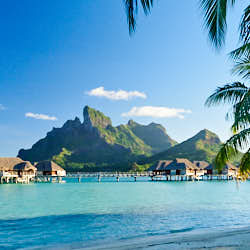 Trip Adviser members voted the Intercontinental Bora Bora as winner of the 'Top 10 South Pacific Luxury Hotels' in 2011. The Intercontinental Thalasso was also the winner of the HM awards for 'Hotel and Accommodation Excellence'. 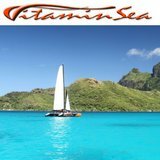 In February 2011 travelers from Trip Adviser voted the view from the beds of the Intercontinental Thalasso as the best in the world. 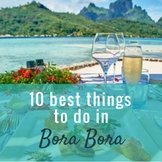 They put this Bora Bora hotel's over water bungalows 1st on their list of top 10 "Best Rooms with a View". 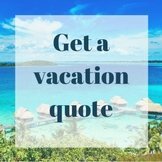 Guests love that they don't even have to walk the few steps to their deck and dive in, to appreciate the most beautiful lagoon in the world. The beds in the over water villas face an entire wall of glass showing off sublime turquoise water. Ehotelier readers concurred. 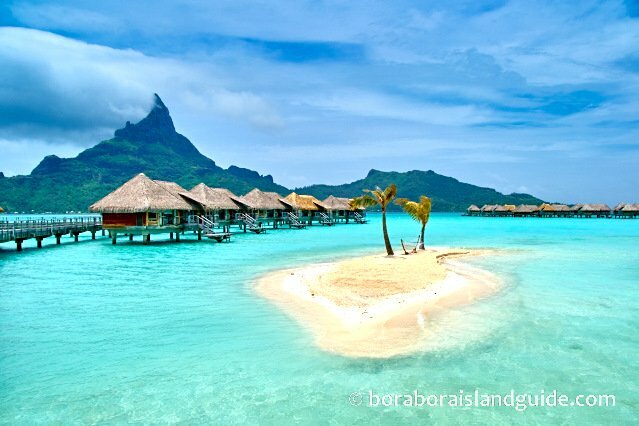 In 2011 they decided the Intercontinental Bora Bora over water villas had the 'World's Best Bedside View'. 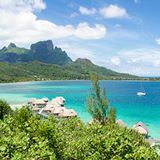 These Intercontinental Bora Bora Thalasso reviews suggest these are the best over water bungalows in the world. There's a lot to be said for a stunning view from your bed. 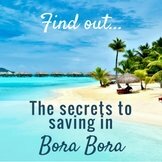 Especially if you're on your honeymoon in Bora Bora! In the November 2011 Conde Nast Traveler awards, the readers placed the Intercontinental Thalasso Deep Ocean Spa 2nd on it's list of 'Top 10 Hotel Spas in Australasia and the South Pacific'. The Deep Ocean Spa was named 'Most Innovative Spa of the Year' by Asia Spa Awards in 2011. 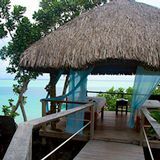 We visited the spa to experience what the Bora Bora Thalasso Reviews were raving about. It was an afternoon of absolute pleasure. Only being out on the Bora Bora lagoon tops this sensual delight. 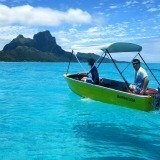 The InterContinental Bora Bora Resort Thalasso deserves acknowledgment for being the very first hotel in the world to successfully implement the "Sea-Water Air-Conditioning System" (SWAC). The SWAC system draws on an inexhaustible supply of non-fossil and completely renewable clean energy. It has zero impact on the environment, is quiet, produces no carbon dioxide or other green house gasses, and saves 90% of the electricity consumed by a conventional cooling system of similar capacity. 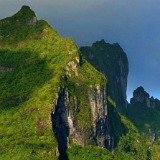 This translates to a reduction of CO2 emissions that is the equivalent of approximately 2.5 million liters of fuel oil imports per year to French Polynesia. Guests at the Thalasso have the best of both worlds. 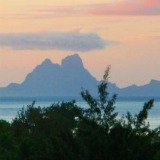 They stay in true 'Private Island Paradise' on a motu and have regular, fast, free access by boat to the main island attractions. The color of the calm, swimming-pool-like lagoon water around the Thalasso is unbelievable. Even with overcast skies, and Mount Otemanu draped with clouds, it remains a vibrant turquoise. It's worthwhile buying the meal plan for breakfast and dinner. The breakfast buffet is amazingly diverse and arrayed so beautifully. It's worth getting up from your over water bungalow for this feast. 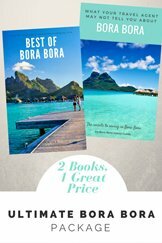 All the Intercontinental Bora Bora Thalasso Reviews of the breakfast buffet, that I've seen, agree. We enjoyed our meals at both restaurants and experienced excellent service. We think the Thalasso Deep Ocean Spa is the best spa in Bora Bora. It offers all kinds of pampering, the grounds are sensational, the views are stunning and the treatment pools and showers have enriching minerals from the ocean depths. No chlorine! (Even the glacier water mineral baths in New Zealand are loaded with chlorine which you can smell from a distance.) After an afternoon relaxing in it's facilities we felt fantastic. 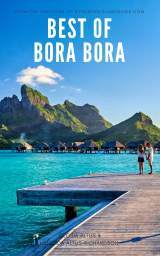 Want to know more about why the Intercontinental Bora Bora Thalasso Reviews are so positive? 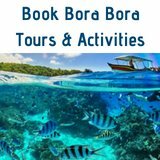 See detailed information about the Intercontinental Bora Bora Thalasso resort.